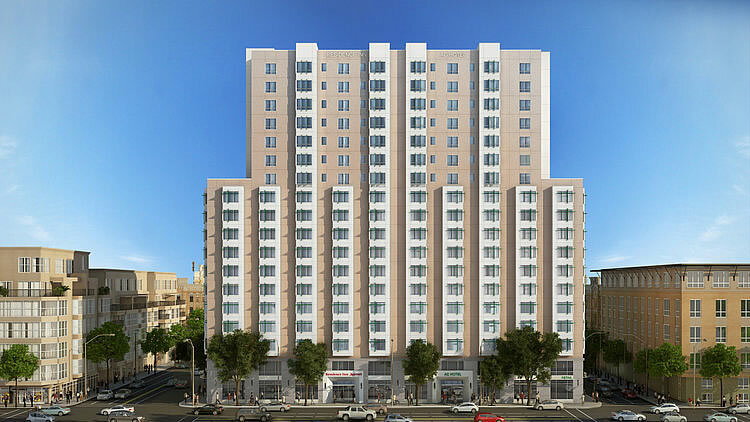 The plans for a proposed 18-story Marriott hotel (with 276 rooms over 1,600 square feet of ground floor retail space and a parking garage for 95 cars) to rise up to 189-feet in height at 1431 Jefferson Street, stretching from 14th to 15th Streets in Downtown Oakland, have been granted urban infill and community plan exemptions from having to complete a more detailed and resource intensive environmental report. Has the palette changed from the original proposal or was that just conceptual? If so, it seems they’re hell-bent on matching the drabness of the Marriott @11th/Broadway, what a pity. And what’s with those cruciform-like thingies over the windows? Too small for sunscreens, too repetitive to really be decoration. It’s listed as 189′ > floor-floor ~10′, which I believe is normal for a residential (hotel) use. And by way of reference, most of the blocks in DO are 200′ N/S (although I believe this particular one is about 215′), so if you want to scale out the elevation, you can confirm the height. The architecture is a little boring but this will be a huge improvement to the surface parking lot and liquor store on that parcel. That part of downtown is really looking up with the now under construction Shorenstein tower at 601 12th Street. The City Center/Civic Center area should be amazing in another 2 to 3 years. This hotel is also a mere two block walk to the 12th Street BART station. This is a great thing since Oakland is way underserved as far as hotel rooms for a city of its size, stature, and incredible central Bay Area location. 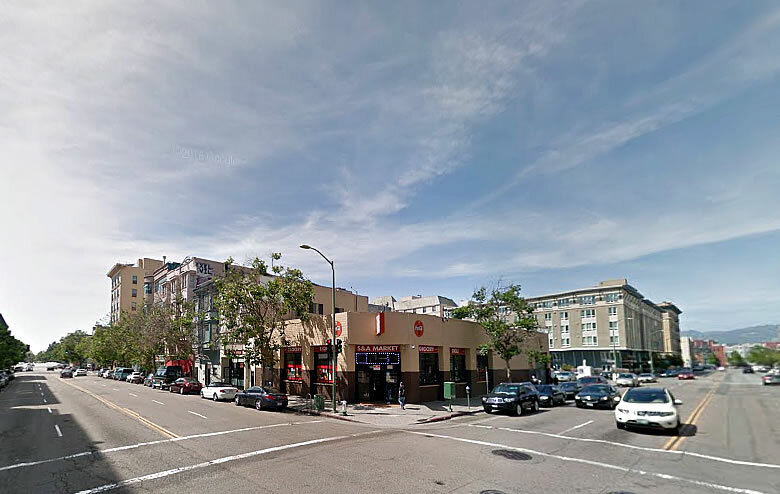 Hopefully there will be a grocery store between the Civic Center/City Center area once the new housing in the pipeline for Uptown, City Center and Old Oakland is built. Where do residents go for groceries in the area? Smart and Final on 11th and Broadway. It’s not great but it does the trick for the odds and ends. That’s what I figured. I guess there are also plenty of options across Broadway in Chinatown but no real modern supermarket. Safeway in Alameda is open 24hr and has free shuttle buses from Broadway. I see tons of people driving or riding the bus to this newer mall (mainly for the In N Out). Also a Safeway up on Broadway/51st/College intersection…also with a free bus running up and down Broadway. Not the best options but certainly a workable situation. what’s wrong with that bird’s eye render? 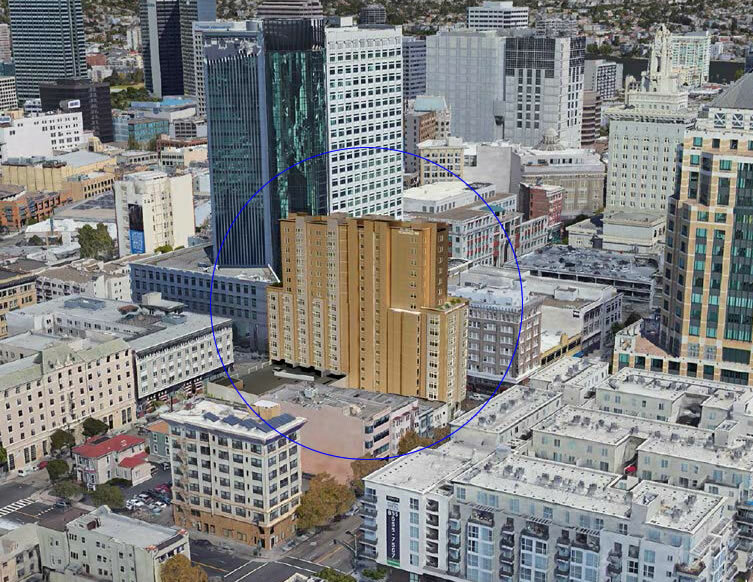 the state office building is only 300-ft or so, and this is 189-ft — yet the render shows the building as less than half the state building’s height. very misleading. The State building is listed as 328′ and is 4.25″ in the photo, the hotel is ~2.75″ (the lower floors are obscured by the buildings in front) 2.75/4.25*328 > 212, so – allowing for some effects of perspective – I would say it’s about right. Looks like the current (awful) crop of Kaiser Permanente hospitals. Is it by NBBJ? a bit of an odd spot for a nicer hotel. this vicinity is pretty skechy at night and dead on the weekends. That’s why you bring more life to the area with a 276 room hotel. This area is much less sketchy than areas where many San Francisco hotels are located. The area is also within walking distance to the many great restaurants and bars in Uptown not to mention the Fox and Paramount theaters. Also, 20,000 people flock to Uptown bars, restaurants and art galleries, every 1st Friday. Sketchy… with $4k/month apartments to the South and $700k condos on the North. The liquor store is magnet for lowlifes, but otherwise the area is pretty normal. yeah, used to be pretty sketchy, but since the residential complex “Domain” opened immediately adjacent to this, it’s been much more active. And, frankly, all of downtown Oakland is much more active in the evenings than it used to be. Agreed, the “Domain” complex is not cheap. 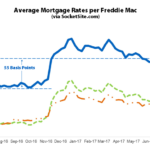 It’s amazing how much rent new construction apartments in City Center and Uptown command. 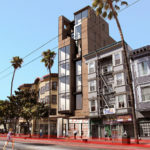 According to the SF experts $4,000 per month rents still don’t justify high rise construction in DTO. With these rents for new construction Oakland should’ve had 20 construction cranes downtown 2 years ago. and if that’s not convincing enough, the paris baguette bakery shop that seem to be gradually attracting more and more daytime visitors that opened up across the street is more indicative of the direction the neighborhood is heading, contrary to the liquor store that is about to be shut down. hopefully this hotel can help provide incentive for more businesses to open in city center in the evenings and on weekends. Email the city I completely agree! Yeah, the more trees the better. We need more trees downtown. Broadway looks nice because of the beautiful trees. The new Latham Square also looks gorgeous with the beautiful new landscaping. Unfortunately Telegraph is drab by comparison. Bring this up with the City. They are still very loathe to plant street trees because there is no maintenance funding in the budget. The city needs to increase its maintenance budget. The parks and street medians look so shabby. Even Lakeside Park is a mess. A real disgrace for a city in a beautiful setting and such a prime location. No problem with building something here, but these renderings are ugly as hell. Big hotel chains should be required to make better architecture in our urban centers. This will be like a cash machine for them for decades. They can put a little effort in. Pretty uninspiring design. The first photo/rendition reminds me of the Glenn Dyer Jail on Seventh St.
That jail has to be the ugliest and most depressing structure in DTO. Sans doubt, uglier than a rotted eggplant. Meanwhile (Friday AM,) another high-density housing development under construction in Oakland has burned. Obviously it’s arson. Stupid black block fools. Thank you for further increasing my property value. I hope developers start pencilling in the cost of serious private security & more cameras for these construction sites. Agreed. The people who did this are evil criminals. However this won’t stop progress in Auto Row. There are nearly 1,000 more units under construction with more ready to break ground in the Broadway/Auto Row area. I’m sure the developer will rebuild and on the same foundation if possible. Hideous, to say the least.